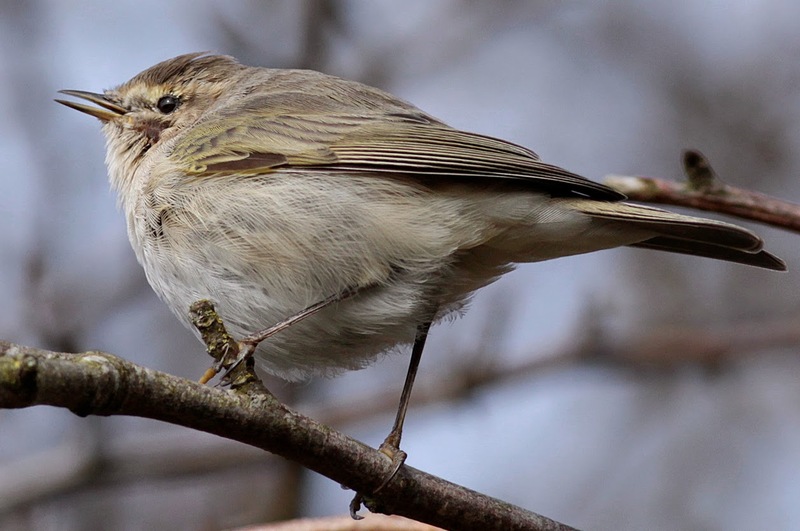 The winter 2014/2015 proved exceptional for the numbers of Common Chiffchaff Phylloscopus collybita at Worcestershire’s sewage treatment works, with three prime localities in the south of the county, Powick, Upton-upon-Severn and Kempsey holding a combined estimated total of 45 – 50 individuals. 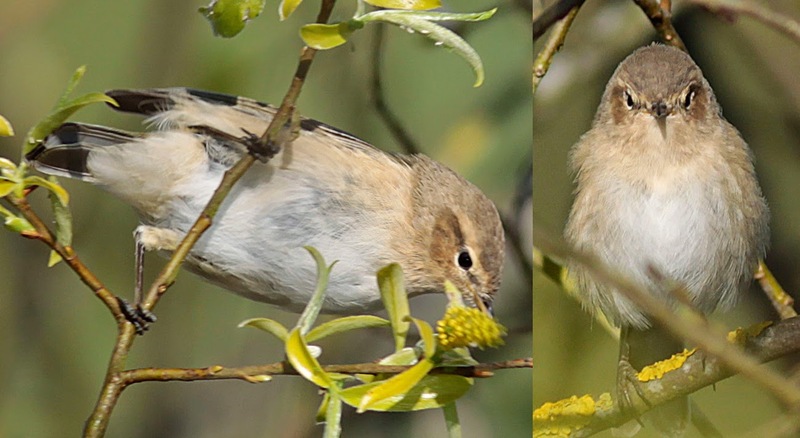 Powick proved the most productive and by late December, two Siberian Chiffchaffs were discovered feeding on the filtration beds and along the adjacent hedges. Fortunately both individuals were often very confiding, allowing an excellent opportunity to obtain detailed analysis of the birds’ plumage, moult strategy and vocalisation. Though generally, the plumage colouration was similar on both birds, distinct differences were reasonably obvious, allowing easy separation in the field and the following article specifically deals with these variations, the timing of their pre-breeding moult and finally vocalisation. This individual showed a distinct buff wash to the breast, flanks and thighs, plus a faint buff wash on the shortest undertail-coverts, whilst the throat, belly and longest undertail-coverts were predominately white. The supercilium was pale buff throughout, the eye-ring whitish, the ear-coverts rusty-buff and a darker brown eye-stripe was prominent, particularly before the start of the pre-breeding body moult. Any traces of yellow were restricted to the underwing-covers and axillaries and the bill was dark throughout. 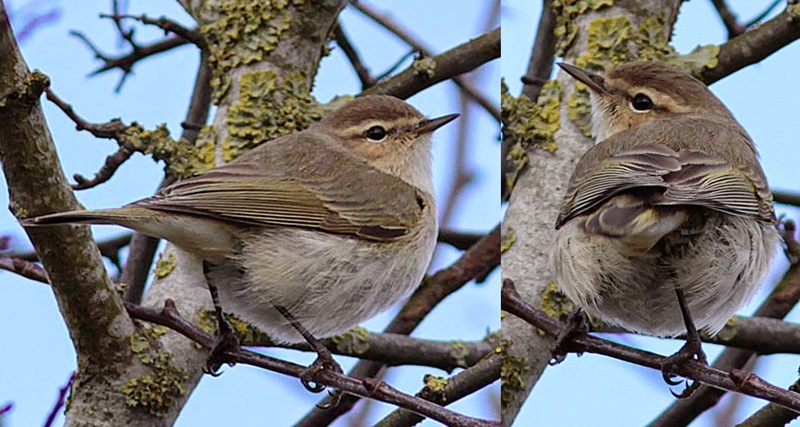 Its appearance matched a so-called ‘classic’ Siberian Chiffchaff. The ear-covert and underparts colouration was pretty much identical to the dark-billed bird, whilst the supercilium, though predominately buff, showed a hint of yellow just above the eye and on the upper eye-ring, being quite obvious on the right side of the face, but far less so on the left. The eye-stripe was lighter and far less prominent, plus the bill was pale along its cutting edge and at the base of the lower mandible. The trace of a yellow tinge above the eye and possibly the extent of yellow on the bill suggests this individual to be a bird from the western breeding range of tristis, which can show limited amounts of yellow on the upper eye-ring, supercilium and underparts and has been assigned the form ‘fulvescens’ (Severtzov 1872). 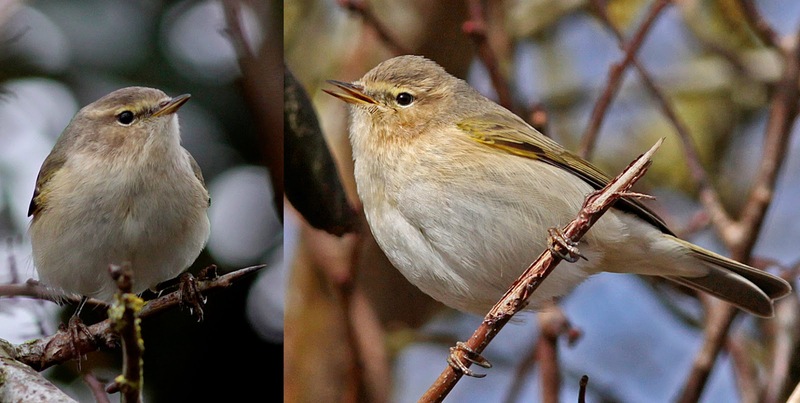 The origins of this additional yellow compared with a ‘classic’ tristis are debated. It may be simply individual or clinal variation or may indicate slight introgression from abietinus populations. 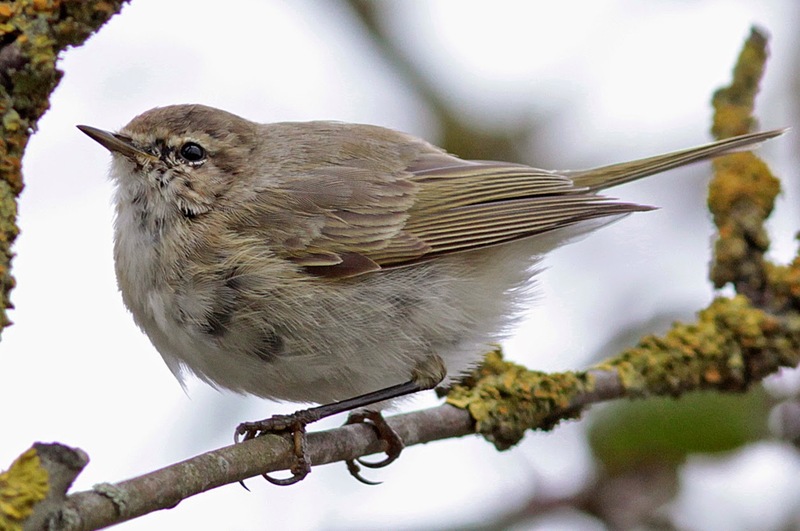 Such individuals are generally treated as a variant of Siberian Chiffchaff and the term ‘fulvescens’, while a convenient designation, has no formal taxonomic significance. Brown-grey on the nape, mantle and scapulars, the latter having very limited olive-green streaking, whilst the crown was a darker uniformed brown and a slight olive-green tinge was present on the back, rump and uppertail-coverts. 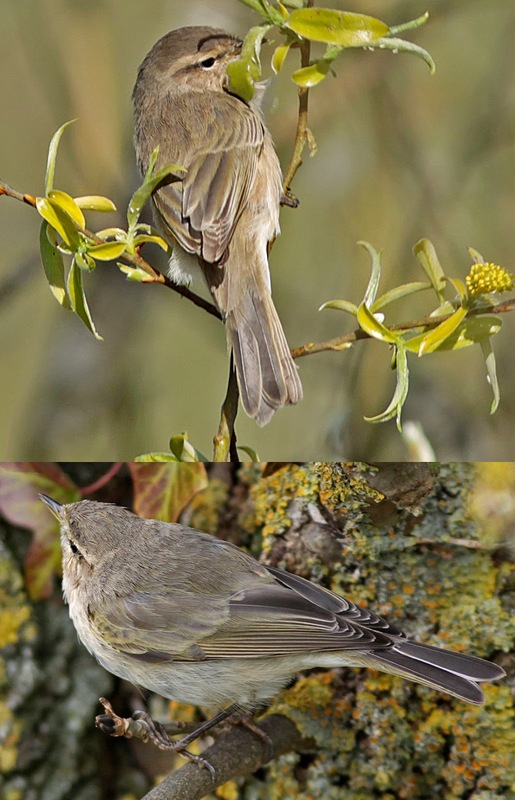 The greater-coverts were broadly tipped buff, forming a distinct, but diffuse wing-bar, the wing-coverts, primaries and secondaries were fringed olive-green and contrasted with the broad buff fringes to the tertials and buff tips to the primaries. A paler sandybrown-grey on the crown, nape, mantle and scapulars, with a slight olive-green tinge to the latter and only a hint of olive-green on the back, rump and uppertail-coverts, so little contrast with the mantle. The greater-coverts and tertials were buff fringed, plus the primaries tipped buff, like the dark-billed bird, but the primaries, secondaries and lesser wing-coverts were edged a brighter olive-green. 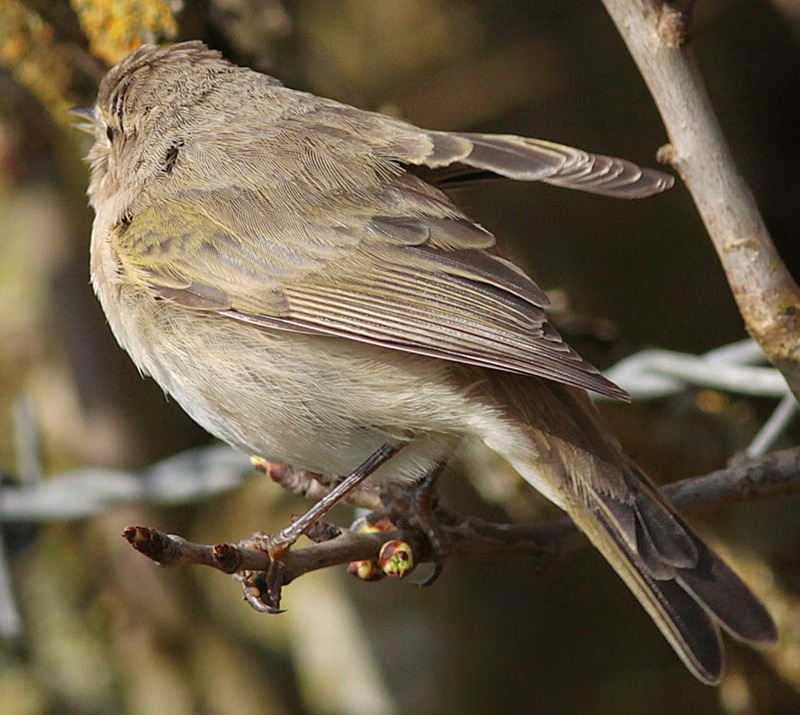 As well as plumage and vocalisation, the timing of the pre-breeding moult is a good indicator, when determining the identification of Siberian Chiffchaff. In the winter quarters, a partial moult is carried out prior to the migration north to the breeding grounds and includes body feathers and sometimes the innermost tertials and central tail feathers. 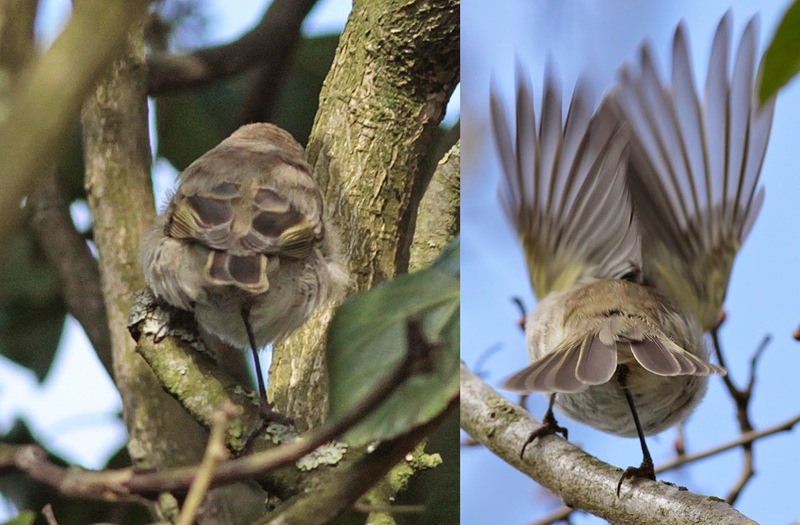 The timing of this moult varies between the races, with nominate collybita being from December – January (Ticehurst 1938; Williamson 1967; Ginn & Melville 1983), abietinus from January – mid-February (Ticehurst 1938) and tristis from mid-February to the end of March (Ticehurst 1938). Plates 3 & 4 above, depict both individuals before the pre-breeding moult on 21st February, holding a full set of tertials and central tail feathers, plus uniformed sleek body feathering throughout. By 14th March, both had dropped their inner and middle tertials, plus the central pair of tail feathers, whilst the first signs of body moult were apparent, predominately on the head and underparts. Note the missing inner/middle tertials depicted in plate 5 and signs of body moult around the face and on the underparts in plate 6. Timing of the moult was almost identical to the dark-billed bird, except for the growth of replacement tertials and tail feathers being more advanced, with the middle tertials just visible beyond the scapulars and the central tail feathers about level with the longest uppertail-coverts. By 21st/22nd March, the new central tail feathers are still hidden below the uppertail-coverts, but the middle tertials are clearly visible, whilst the tips of the innermost pair are only just protruding beyond the scapulars. The central tail feathers and both the middle and innermost tertials are approximately ¾ grown, whilst there is heavy feather moult on the cheeks by 21st March. Typically, Siberian Chiffchaffs are frustratingly silent on the wintering grounds, which seems unusual considering Common Chiffchaff collybita is so vocal. Despite over 40 hours spent with both individual between late December - early March, the pale-billed bird was heard just once, whilst the dark-billed bird remained silent until 14th March. 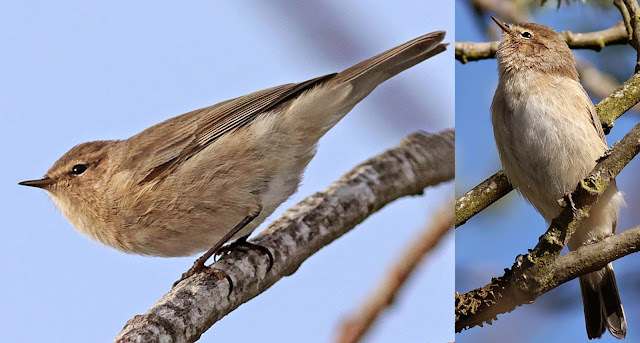 Hereafter, they became a little more vocal and was soon apparent that as well as the classic tristis call, two distinct variant calls were included in both birds vocabulary. Unfortunately neither turned out to be singing males. Call 1- A slight variant of the classic even pitched ‘peet’ call of tristis, being an near-monosyllabic ‘sweeoo’, marginally rising in pitch at the beginning, levelling out at 4.3 kHz, before dropping to 3.6 kHz. Call 2- A loud, straight, almost monosyllabic note, rising in pitch from 3.2 kHz - 4.9 kHz, then a slight fall in pitch towards the end. 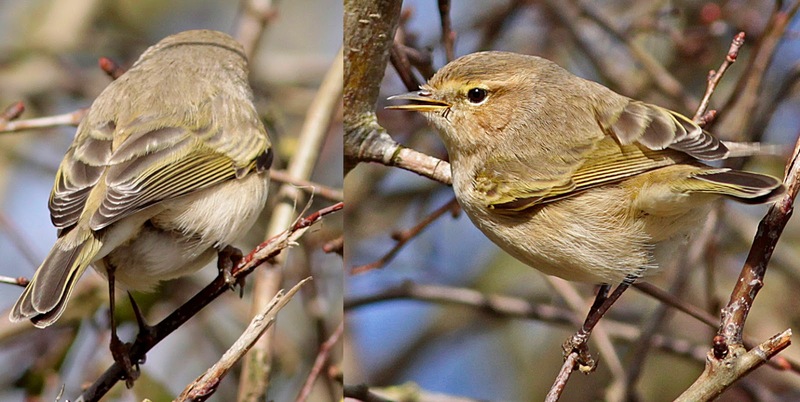 Call 3- A much quieter, thinner call compared to the latter and structurally more similar to the rising disyllabic ‘hweet’ call of Common Chiffchaff collybita/abietinus. The call ranged from 3.1 kHz – 5.3 kHz. 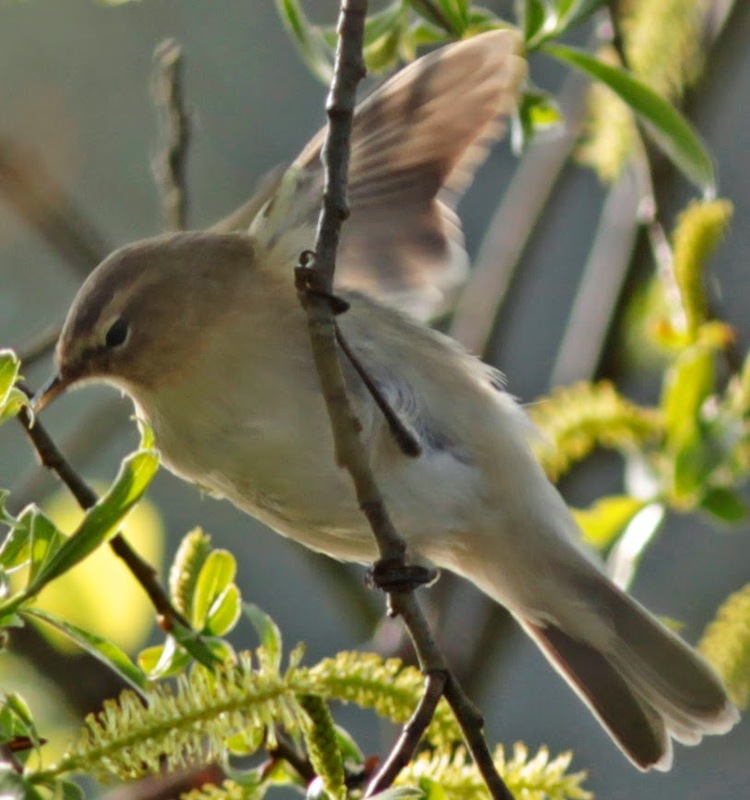 The tristis ‘peet’/’sweeoo’ call was heard on two occasions, but eluded the recorder. Calls 1 & 2- These two are subtle variants of the same call, being very similar to call 2 of the dark-billed bird in volume, pitch and structure, though slightly brighter and sharper in tone. Call 1 had a shallow drop in pitch at the beginning, whilst this is lacking in call 2. Both calls ranged from 3.2 kHz – 5.2 kHz. 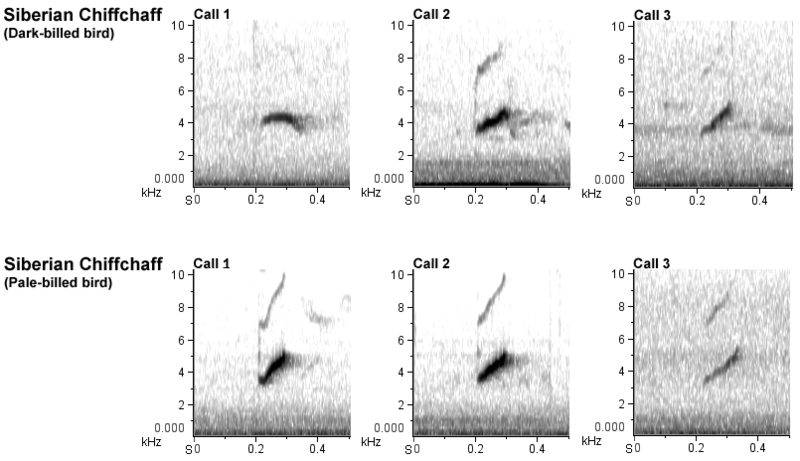 Call 3- Identical to call 3 of the dark-billed bird in volume and structure, but ranged from 2.8 kHz – 5.5 kHz. All calls from both individuals were reasonably consistent in length, ranging from 0.13 – 0.15 of a second. Many thanks to Alan Dean for his input and advise during the production of this article. Written and compiled by Andy Warr. 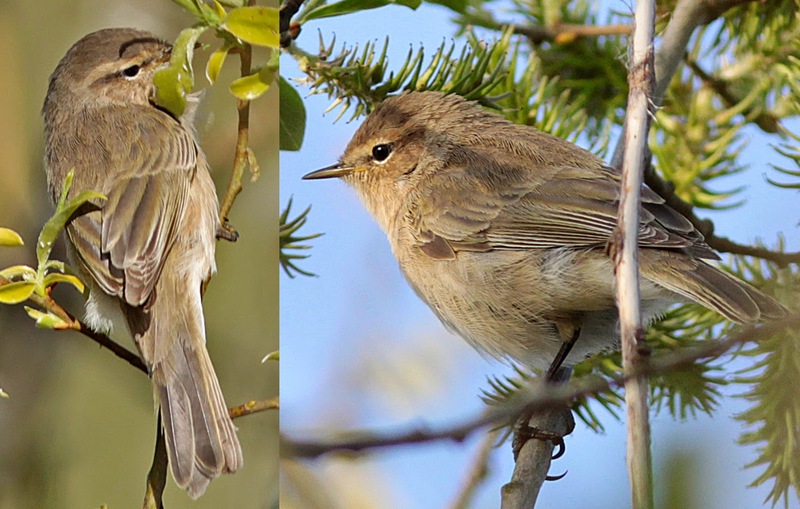 On 22nd April 2015, a singing Siberian Chiffchaff was discovered by Brian Stretch at Camp Lane Pits, Grimley. The bird remained onsite for a couple of days, favouring a stretch of partly submerged Willow along the eastern shore of the southern pool and like the Powick birds, gave an excellent opportunity to study both plumage and vocalisation. The crown, mantle, scapulars, back and uppertail-coverts were a uniformed brown and lacked any obvious olive-green flecking throughout, whilst the rump possessed a slight olive ting and the nape had a greyer cast. The greater-coverts were fringed buff/off-white, the tips forming a narrow, diffuse wing-bar and the remaining wing-coverts, primaries, secondaries, tertials and tail feathers were also fringed/tipped buff, with only the slightest hint of olive-green present, so minimal contrast in colour between the remiges/rectrices and the upperparts. A strong buff colouration to the throat, breast, flanks, vent and thighs, whilst the belly and undertail-coverts were white. No trace of yellow could be detected on the underparts, plus appeared very limited on the lesser underwing-coverts, with just a hint of lemon-yellow on the latter and at the bend of the wing (see plate 6), though the extent of yellow on the axillaries was undetermined. This individual has completed its pre-breeding moult and it’s body feathers are sleek and pristine. It has been aged as a first-winter, due to contrast between the new, darker and broader fringed inner greater-coverts and the shorter, paler and narrowly fringed juvenile outers, plus the even growth-bars across the outer tail feathers. The exposed primary tips and outer tail feathers were particularly worn and bleached to a dull pale brown and contracted with the fresher central tail feathers and tertials, all three of the latter appearing to be of the same age, so lacking contrast between any newly moulted inner tertials, if replaced during the pre-breeding moult. This suggesting that all the tertials and probably the two central pairs of tail feathers were replaced during the post-juvenile moult. An adult wouldn’t show any contrast in the greater-coverts, have uneven growth-bars in the tail and would be expected to possess a darker and glossier appearance to the primaries and outer tail feathers at this time of year. The pre-breeding moult is believed to be more extensive in adults, than first-winter birds. The angle of the bird, plus light conditions in the photograph show perfectly the features mentioned above. 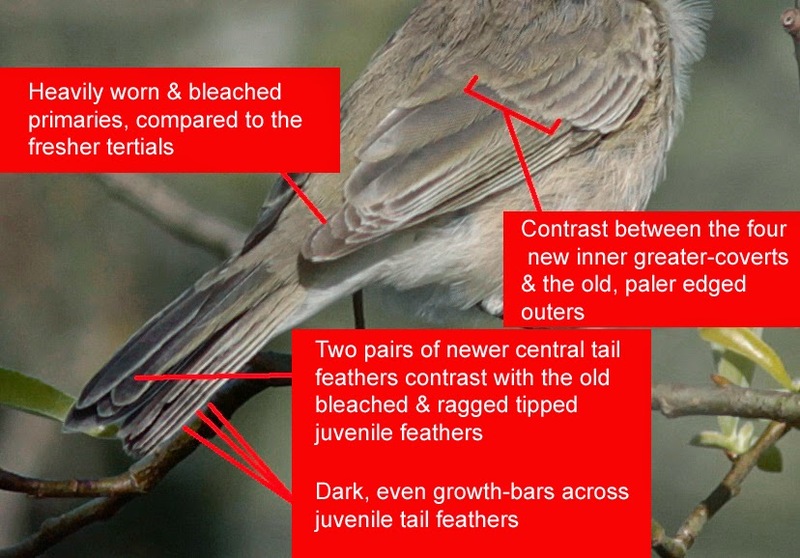 A comparison of the remiges/rectrices to one of the Powick birds, which was considered an adults due to feather condition and the extensive pre-breeding moult. Many recordings were obtained of the song and a sample of these are featured below. Its song was pretty consistent throughout and no song switching was heard from tristis to collybita/abietinus, or vice versa. Most, but not all the sequences recorded, included some note signatures shared by or very similar to collybita/abietinus and though these signatures are difficult to detect by ear on the recordings, they a visible on the accompanying sonograms, conveying the appearance of a reverse tick, and have been marked with a red line. Click on sonograms to enlarge. Quite a few collybita/abietinus type note signatures are present during the first half of this sequence, but are absent towards the end. Duration 18 seconds. A shorter song, with two collybita/abietinus type signatures at the end. Duration 7 seconds. An even spread of collybita/abietinus type signatures. Duration 9.2 seconds. A single collybita/abietinus type signature at the end of this song. Note the variation in structure of this note, compared to the other collybita/abietinus type signatures, distinctly rising at the start, then falling sharply before rising again, resulting in a very close start and end frequency of the complete note. Duration 11.7 seconds. No collybita/abietinus type signature throughout. Duration 6 seconds. A very short burst of song, again lacking any collybita/abietinus type signature. Duration 3.2 seconds. This was by far the longest song sequence recorded, lasting for 46 seconds. Parts which included the collybita/abietinus type signature appeared ordered in distinct phases, forming a reasonably consistent pattern in both timing and duration. Consequently, there appeared to be an ordered structure to the song. The timing and length of these phases were as follows. This anomaly appeared consistent throughout all the longer song sequences recorded, including song sequence 1, where this signature was present for the first 10.3 seconds, then absent for the remaining 7.3 seconds of the song. A bird, who’s song includes note signatures shared by collybita/abietinus, within an otherwise classic tristis sequence, have been referred to as a mixed singers, but this may be inappropriate if proven to be an integral part of the tristis song. 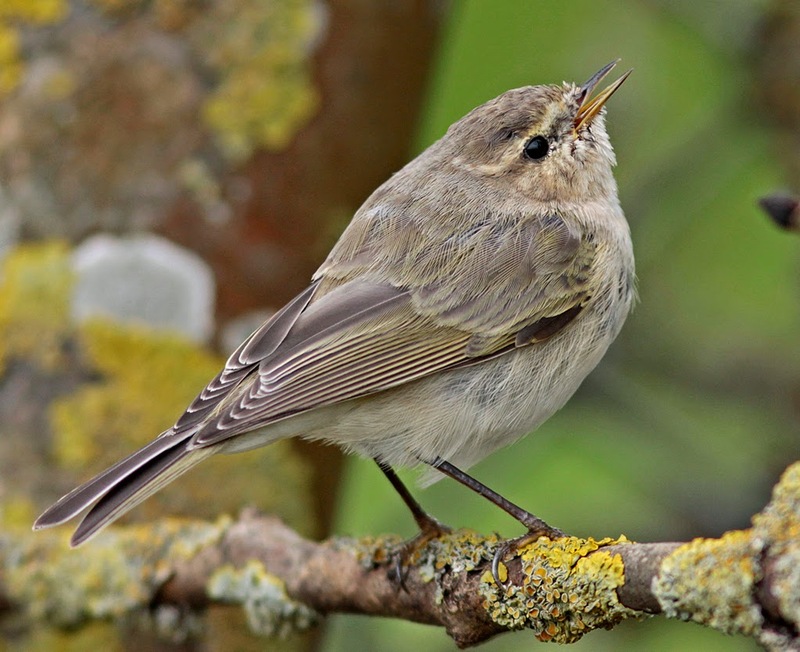 Recordings of song were analysed from Siberian Chiffchaffs well to the east of the zone of overlap between abietinus and tristis and yielded some interesting results. Recordings were selected from the bird sound website Xeno-canto, of individuals over 250miles east of the Ural Mountains, which mark the eastern boundary for abietinus, during the period late May, to the end of June, so presumably territorial males, rather than passage birds, which may be heading to their breeding grounds west of the Urals. Seven, of the nine recordings found, contained collybita/abietinus type, or similar note signatures within the song and these are featured below in sonogram form, plus the date and a link to each recording has been included. 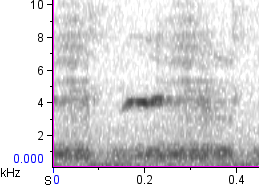 Also one recording came from within and the other six outside the proposed range for ‘fulvescens’. In addition, another recording was analysed from the tristis breeding range in Kazakhstan in early May, so potentially a territorial male, but a passage migrant couldn’t entirely be ruled out. ﻿Sonograms were produced for the entirety of each recording, then the best sequences selected for each bird, so most, but not all will appear the same as the sonograms featured on Xeno-canto, which portray the first song sequence from each recording. Shapsha, near Khanty-Mansiysk, Russian Federation, on 15th June. Berdsk, Russian Federation, on 21st June. Ongudaysky District, near Gorno-Altaysk, Russian Federation, 29th June. Ider Gol, Northern Mongolia, 25th May. Turochaksky District, near Gorno-Altaysk, Russian Frederation, 16th June. The toppled Z note signature is present throughout this sequence, an identical signature to the one noted in song sequence 4 of the Grimley bird. This recording consisted of five song sequences from the same individual and includes all the collybita/abietinus type note signatures featured in recordings of the Grimley bird. The signature which drops from the start is present in sequence 1 (third marked), plus the last marked note in sequence 4 & 5, the one with the slight rise, before falling is repeated in all five sequences, whilst the toppled Z note is in sequence 4 (second marked). Unfortunately, there were no recording on Xeno-canto of birds from the eastern breeding range of tristis. This individual rarely called, but two distinct notes were recorded, the first a classic tristis, even pitch monosyllabic ‘peet’ and the second, a very quiet, rising disyllabic ‘hweet’. 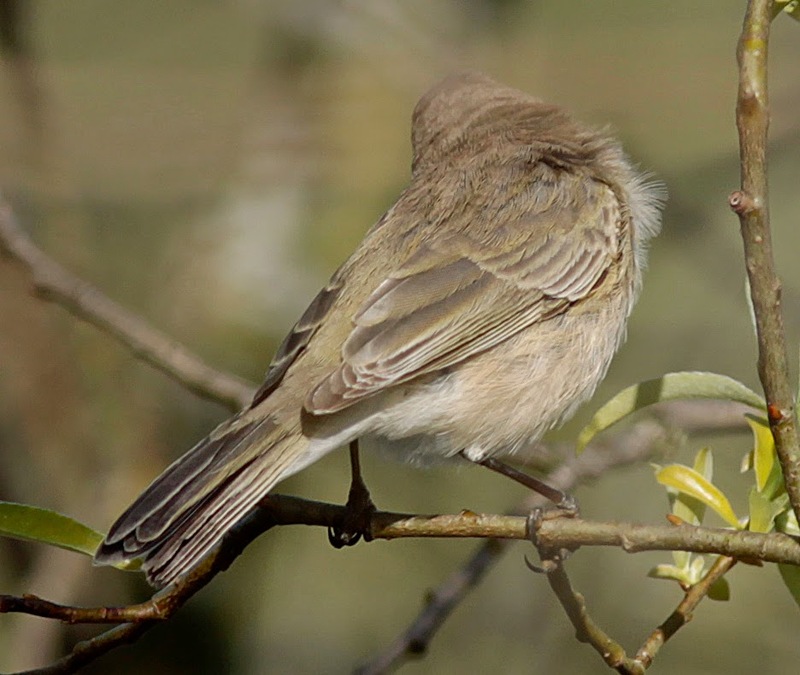 The classic tristis ‘peet’ call was heard on at least three occasions. For recording click here Taken from a video recording by Brian Stretch, the call being right at the start of the recording. The ‘hweet’ call was heard on at least four occasions and ranged from 2.8 kHz – 4.6 kHz. Note how similar in appearance the ‘hweet’ call signature is to notes included within the song. This may be one explanation for why calls sometimes deviate from the classic tristis ‘peet’. On plumage, the Grimley bird appears about as good as it gets for classic tristis and whilst its song included note signatures similar to collybita/abietinus, this is matched by recordings of tristis at least as far east as the central breeding belt and beyond the recognised limits of ‘fulvescens’, so consider it inappropriate to describe this particular individual as a ‘mixed singer’. 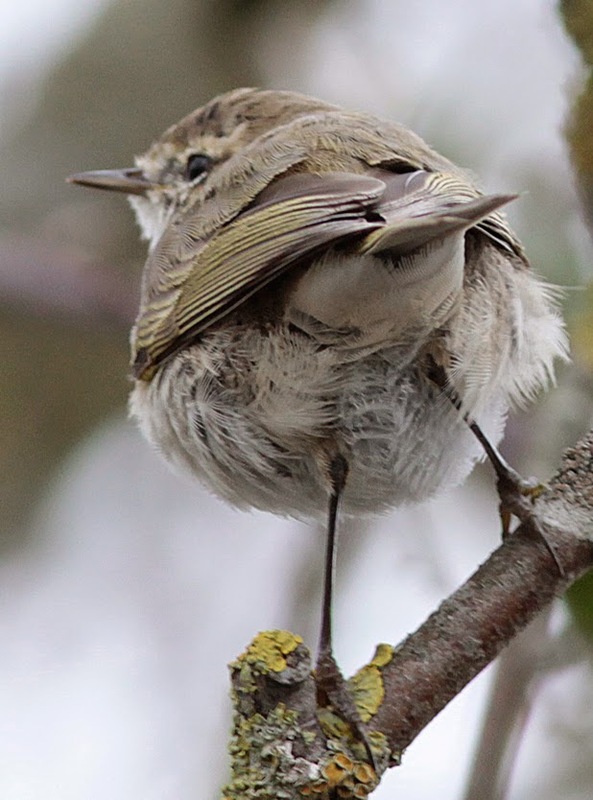 Based on the aforementioned, I conclude that this was a thoroughbred Siberian Chiffchaff, which in turn, shows that call can deviate from the so-called classic tristis ‘peet’. 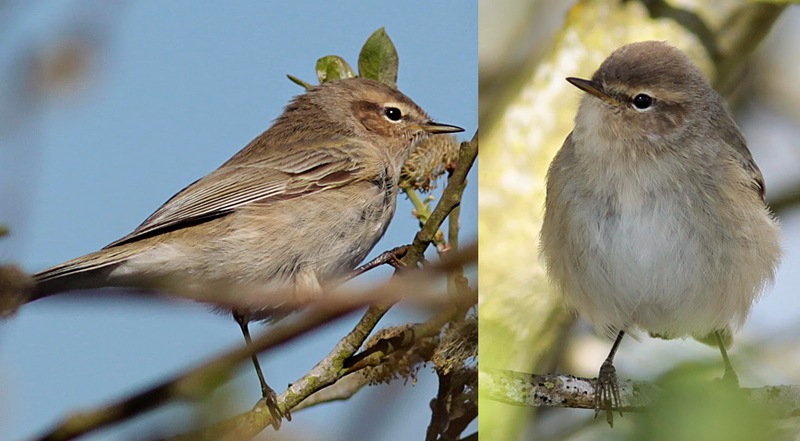 Excellent read Andy, 2-3 Siberian Chiffchaffs wintered on my local ponds, one now singing see https://www.devonbirds.org/news/bird_news/devon_bird_sightings?blogEntry=8082 I had included previous posts about the same birds including recent moult just search on the website under siberian Chiffchaff. 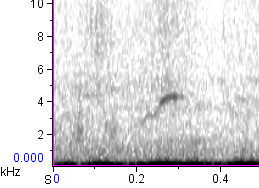 Very interested to see and listen to recordings from the same individual tristis of different calls from classic sounding tristis to calls closer to collybita something I have noted over the years here in Torbay. Thanks for your comment Mike. Just checked out your Siberian Chiffchaff link and excellent recording of the singing bird. I was gutted that both the Powick birds failed to sing, guess they must have been females, but I did have one singing at another Worcestershire STW this winter and two singing males at Powick last winter.